Sulphur (Methyl Sulphonyl Methane - MSM) is a dietary supplement that can help to reduce the pain, inflammation and symptoms of endometriosis. MSM is Methyl Sulphonyl Methane - is a form of organic sulphur that is stored in every cell of our bodies. The body uses sulphur continuously to create new cells; without it the body will produce weak and dysfunctional cells. We are supposed to get sulphur from our food but even washing food can remove the sulphur; processing food certainly will. Sulphur surprisingly is the third most abundant substance in our bodies. If we do not feed ourselves enough sulphur (MSM) there will be consequences and sulphur deficiencies have been associated with arthritis, acne, rashes, depression and memory loss as well as slow wound healing, gastrointestinal problems, inflammatory problems, scar tissue, lung dysfunction and immune dysfunction. As sulphur is lost in food processing, sulphur deficiencies are very common today. It will make everything soft. It can soften your eyeballs making them easier for your eye muscles to focus; it can soften your digestive system making it impossible for parasites to get a grip; it can soften your hormonal glands returning them to optimal functioning. It can soften your brain making it difficult for heavy metals to get a grip; it can soften your muscles and ease muscular discomfort and tension; and within four or five days of taking an MSM supplement, it will soften your skin noticeably. This last change I can testify to, because it has softened my skin. Approximately half of the total body sulphur is concentrated in the muscles, skin and bones. One of the most significant uses of MSM as a supplement is its demonstrated ability to relieve pain and inflammation. When rigid fibrous tissue cells swell and become inflamed, pressure and pain result. Since MSM can restore flexibility and permeability to cell walls, fluids can pass through the tissues more easily. This helps equalise pressure and reduce or eliminate the cause of pain. Harmful substances such as lactic acid and toxins are allowed to flow out, while nutrients are permitted to flow in. This prevents the pressure build-up in cells that causes inflammation. MSM makes cell walls permeable, allowing water and nutrients to freely flow into cells and allowing wastes and toxins to properly flow out. The body uses MSM along with Vitamin C to create new, healthy cells, and MSM provides the flexible bond between the cells. Without proper levels of MSM, our bodies are unable to build good healthy cells, and this leads to problems such as lost flexibility, scar tissue, wrinkles, varicose veins, hardened arteries, damaged lung tissues, dry cracking skin, digestive disorders, joint problems, and inability to defend against allergic reactions to food, animals and plants. MSM is an anti-oxidant that helps to clean the blood stream and flush toxins trapped in our cells. It is also a foreign protein and free radical scavenger. In order to maintain good health, we need to supplement our diets with MSM, to enable the body to heal itself. The body uses what it needs, and after 12 hours will flush out any excess amounts. 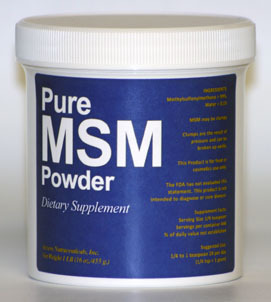 MSM is available as a supplement in a variety of forms. I have found the cheapest to be a loose powder which I mix with orange juice, and take first thing in the morning.